Patrick Star – From SpongePedia, the biggest SpongeBob-wiki in the world! Strength: He is very hard, can open even Slimelich Maneuver (Porous Pockets). Weight: 2 ounces but 6 inches tall. This page is about the character. For appearances click here. Patrick Star is a dim-witted but well-meaning starfish who is the best friend of SpongeBob SquarePants. He is quite overweight and loves ice cream and many other fatty foods. He is the deuteragonist of the show. SpongeBob and Patrick often annoy Squidward to no end, but both of the two are blissfully unaware of it. Patrick first obviously appeared in the episode: Help Wanted although his first main role in Season 1 is in the episode: Bubblestand. He was born in February of 1978. He is a 34 year old who acts like he is 3. Once, to help SpongeBob get into the Salty Spitoon, he pretended to get beat up by SpongeBob so his best friend would seem tough. He is very loving also and he admires Jeffrey Jellyfish. In the episode: I'm Your Biggest Fanatic, SpongeBob and Patrick went to the Bi-Annual Jellyfish Convention and saw many of their favourite jellyfish enthusiasts, such as Kevin the Sea Cucumber. Patrick can also play the drums. As seen in the episode: Band Geeks, he plays the drums, in the Campfire Song Song in the episode: The Camping Episode, Patrick had drums for a brief time, until he destroyed them in the end. In the videogame Lights, Camera, Pants!, Patrick plays the drum and sometimes uses his head to play the drums. However in the TV Movie: Atlantis SquarePantis, Patrick is more interested in alternative music. After failing or graduating community college, he has no job now because he did not go to a good school to graduate and become a great man. He often does not have enough money, and then in the episode: Pat No Pay, obviously by the title, Patrick Star cannot pay back for his Krusty Krab meal because he does not have any money. Patrick Star has also had his identity and ID licenses shown in the episode: Mermaid Man and Barnacle Boy III and Driven to Tears. 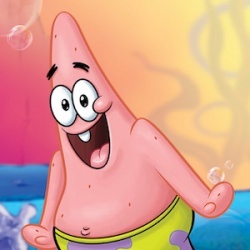 Patrick is known to cause many troubles, and usually makes the main problem of the episode he appears in. Patrick Star is also pink, much to SpongeBob's fun teasing in the episode: The Fry Cook Games. He somewhat attended Community College, which probably means that he will never be well-educated or have a good job. His parents are known to have kicked him out, which was the main reason he built his own home. Patrick has also been emotional about his parents' getting rid of him to make him think he is an orphan and believe that SpongeBob's parents are his parents in: Driven to Tears. Somewhat, he still was very happy and never went back to his parents' house again. Patrick has been sent to jail many times before. He went to prison in these episodes: Life of Crime, SpongeBob Meets the Strangler, Good Ol' Whatshisname, and The Inmates of Summer. Patrick is also pink, but has darker pink freckles and jellydots around his body. He is also shown to be able to move the jellydots around his body. In Season #1, due to an unsteady animation process in this season, his eyebrows are M's and this last occurred in the episode: Hooky. Patrick has Zs for his eyebrows starting in the episode: Your Shoe's Untied. Patrick is also shown to develop a love of rocks. He usually lives in a rock, had a rock for a pet, uses rocks to make Valentine's Day gifts, eats rocks, uses rocks as tools, and most likely relaxes flat and enjoys sun ray catching while sitting on a rock flat. He is also very strong and can move his rock, although he did not in: Life of Crime. Patrick Star is also wearing green pants with purple flowers. Patrick as a young schoolboy. Not much of a difference, eh? Patrick Star usually is so much beloved to SpongeBob he mistakes SpongeBob's family for his own family. In the episode: The Sponge Who Could Fly, he believed that SpongeBob's Grandpa is his, and Grandpa SquarePants became angry at Patrick for making him appear in his own dream-cloud and hits him with a stick. In the episode: Driven to Tears, Patrick is never able to know, no matter how many times told from SpongeBob's parents that they are not his parents. This made Patrick think he was an orphan. He has also been known to marry SpongeBob in Rock-a-Bye Bivale to let SpongeBob do all the work for Junior the Scallop. Patrick Star also has arachnophobia, or the phobia of spiders, revealed in the episodes: Home Sweet Pineapple and The Pink Purloiner. But it's a mystery why there would be spiders in the ocean. The spiders would be almost as big as Patrick, and to Bikini Bottom, they are bugs who have the same personification-like size to the fish and ocean mammal's point of view. In the episode Squirrel Jokes it showed Patrick sitting at a table with Nancy (possibly he was dating her). Big Pink Loser: He swept dust all the time, spilled dishes on purpose, and tried to open a jar of jam. That's No Lady: Patrick, disguised as a girl named Patricia, did a very good job to stay in town, but Mr. Krabs and Squidward fell in love with him/her. Pat No Pay: Patrick Star had to make enough money to replace his bill. He destroys the Krusty Krab with trash. 20,000 Patties Under the Sea: He is the assistant manager to SpongeBob as the restaurant mobile to bring Krusty Krab to the people. He also has a job for working in the kitchen. Lights, Camera, Pants! (PC Version) He worked his own lemonade stand for a short time. He earned 25 cents. Inventor of the Back Scratching, Nose Picking, Hair Combing, Ukelele Tuning Machine 9000. Inventor of Pencil, Mirror, and Lightbulb but was already taken up by the real creators. Patrick enjoys eating very much. He likes Chili, as seen in the episode Doing Time. He likes ice cream, Jellyfish Jelly sandwiches, Krabby Patties, chocolate bars, peanut butter and Peanut Butter Tacos in Picture Day, cheese from the hooks, pickles, astronaut-dried food marshmallows, sandwiches, turkey, hot dogs, smoked sausages, roast chicken, beef, pizza and many other random junk foods. Patrick appears to have psychic abilities, as evidenced in the episode: No Weenies Allowed (he made it look like an invisible bully was beating him up), and Night Light (levitated in such a fashion that he appeared to be running up an invisible staircase). Patrick is a good driver, unlike SpongeBob. In Driven to Tears, he got his license on his first try. When he gets hit in "Lights, Camera, Pants! ", it is revealed that Patrick is padded ("That'd Hurt if i wasn't so Padded."). Of course, he is referencing his weight. In SpongeBob.com, it reveals his attention span is .02. It is revealed in SpongeBob.com he went to community college. In the episode Chum Bucket Supreme, it is told that he HAS a brain. It is a Department of Thoughts. Patrick has never been the only main character before until Rise and Shine and The Doughnut of Shame. This page was last modified on 8 March 2019, at 15:01. This page has been accessed 206,098 times.